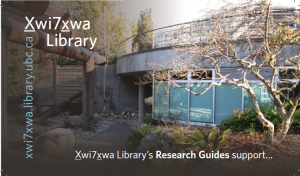 Check out UBC Library’s Graduate Student Research Guide for everything you’ve ever wanted to know about UBC Library! Be sure to check out the Education Library’s website for additional information (click on the Grad Student tab). Librarians at the David Lam Management Research Library have developed and published a new Research Guide on the Arts, Media and Entertainment Industries. This guide is of interest to researchers conducting business or market planning in the cultural industries, as well as those exploring this sector for career research.